organized by iRead Book Tours. 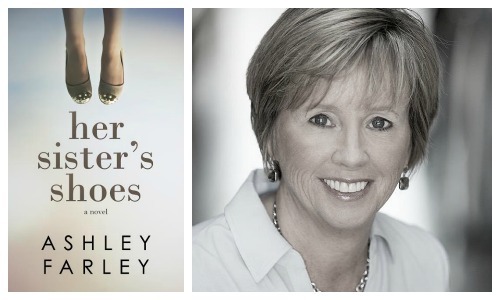 Her sister’s shoes is a family saga about three sisters whose lives are far from perfect. Jackie, the oldest, is a cold and selfish woman whose marriage is about to end abruptly, but she is only concerned about keeping up appearances. The second sister, Samantha, is struggling with her teenage son, Jamie, who had a terrible car accident some months ago and he is not only in a wheelchair, but with a terrible depression that Sam doesn’t know how to cope with. Finally Faith, the youngest sister, lives in fear of her husband, who is becoming abusive towards her and their little daughter. Sam, Faith and their mother, Lovie, are just reopening a seafood market the family have owned for years, and it feels like it should be changing their lives for the better, but this doesn’t happen – the sisters will have to learn how to rely on each other in order to overcome their problems. This is a charming story about love and trust in your family members, who are the ones who will always be there to support you. I liked the main characters, especially Samantha, who has to do all the hard work, putting the others together and making them open their eyes, but she is actually not as strong as she looks in the outside. The secondary characters are also lovely, and I really felt so sorry for Faith’s daughter, and also for Jamie, who manages to avoid focusing on his own suffering when he learns that his little cousin needs his help. I have to say that the story was very predictable in the end, but I suppose this predictability comes with the genre itself, so I would have been really shocked if the end was different! In any case, I think happy endings are what you are looking for in these kinds of books, right? And finally, I would like to comment briefly about the setting: the story takes place in a small town in the coast of South Carolina, being it so idyllic that you can’t believe people might not be absolutely happy in such a place. I also felt that the story needs a prequel to talk about how Lovie and her husband ended up there and made their living by fishing and selling the food in the street at the beginning, and then building their own market. I think it makes for a lovely story too. To summarize, I think Her sister’s shoes will please women’s fiction readers who want a joyful and engaging summer read with lovable characters.